Can farming serve as therapy for those afflicted with cognitive disabilities? The answer’s not as far out there as you might think. In fact, it’s just an hour from the bustling streets of Philadelphia on the serene farmland of Chester County’s Camphill Village Kimberton Hills. The planned community is home to over 100 individuals, 40 of whom are diagnosed with a variety of cognitive disabilities—including autism, Down Syndrome and brain trauma. 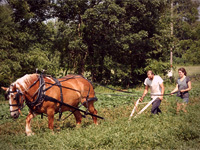 Rather than isolating those with special needs, the community’s success depends upon the interactions of all community members through biodynamic agriculture. In work teams, the residents of Kimberton Hills educate one another in daily give-and-take through which the term “disabled” becomes a misnomer. For locavores, the morning moments spent at Philadelphia farmers markets can be defined as delicious bliss. When the temperatures hit their harshest levels this summer, chill out by turning the local bounty found at the market into refreshing summer sips that don’t rely on tea or citrus shipped from miles and continents away. Calkins creamery in honesdale makes a brie-style cheese called Noble Road that has garnered a cult following. But the creamery also produces a Gouda-style heartthrob with a nutty swagger, which is just as fabulous. If Robert Redford were a cheese, he’d be this one. Old Man Highlander even has a leathery exterior. Inside though, it’s all walnuts and sweet cream, thanks to the unpasteurized milk of Delaware River Valley Holsteins. 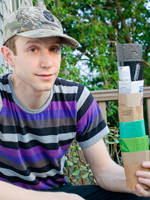 I don’t go to coffee shops that often, but I’m obsessed with the waste they generate. (Okay, I’m obsessed with the waste everyone generates). ¶ Coffee shops are big business, and, as such, one with a big footprint. But it’s also an industry with a reasonable shot at attaining nearly zero waste, at least on the retail end—very little that goes into making coffee can’t be easily reduced/reused/recycled. There are so many creative individuals and groups in Philadelphia,” says Theresa Rose, founder of Philly Stake, “but their grassroots organizations have few ways to get funding, especially on a small level.” Rose credits Philly Stake’s success to its ability to fill this unique niche: boosting community-based projects with recurring fundraising events centered around a locally-sourced meal. In europe, they simply call it the common reed, but over here we can’t dignify the villain with such an innocuous name, especially when its scientific name, Phragmites, sounds so sinister: “frag-MITE-ees,” pronounced with a grimace. Local florist Jennie Love of Love ‘N Fresh Flowers teaches you to create a bouquet of bright, homegrown blooms. 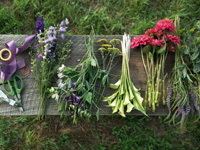 On a large work surface, lay out all the flowers you want to use, keeping them in single-variety piles. The amount will depend on the size of the flowers you select. Use at least 20, and as many as 50. Strip the leaves off all stems. Have scissors, a rubber band, florist tape, ribbon, and pins or glue at the ready. 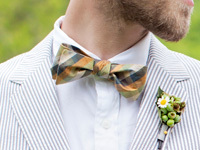 Better known for their whimsical mustache-on-a-stick hand-held disguises, design duo Something’s Hiding in Here are currently spending their time creating funky bow ties using found vintage fabrics in a rainbow of colors and patterns. Whether your inspiration is Gatsby’s Daisy and her flapper frocks, the tightly cinched cotillion dresses of the ’50s or a flowing flower-child number, brides seeking upcycled, era-appropriate wedding attire will find dress destiny among Mill Crest Vintage’s collection of 19th- and 20th-century gowns and party dresses. With prices for commodities like butter, sugar and flour steadily rising, a picture-perfect castle of wedding cake can carry a steep price tag, especially when made with organic and local ingredients. If you still lust for a traditional tower, look to a local bakery with lots of experience working with organic flour and sugar, like Lotus Cake Studio (lotuscakestudio.com). Though they don’t make organic cakes, Night Kitchen Bakery (nightkitchenbakery.com) practices sustainability with a comprehensive recycling program, composting of food scraps and rain harvesting. Ask your baker for local fruits, herbs and flowers, and Fair Trade chocolate and nuts for garnishes as nice to eat as to admire; or just chuck it all and order up an array of seasonal fruit pies or a cool ice cream bar from your local favorite. Lights, camera, “I do.” According to greenerphotography.org, over 16.5 billion pictures were printed in the U.S. in 2008. That accounts for photography’s largest ecological footprint ever, even when you consider the prevalence of digital photography. Local professionals can reduce their impact by offering online booking and look books, recycling electronic waste and printing on recycled paper. To engage family and friends in memory-making without throwing away all those disposable cameras, the Wedding Lens allows family and friends to upload their photos from the wedding all in one place. No registration is required, and bulk uploading is easy enough even for the tech-challenged: Guests can even choose pictures to print right from the website. Just give guests the web address, and they become your photographers. Visit greenerphotography.com to find a wedding photographer; visit theweddinglens.com for more information on setting up your own crowd-sourced photo site ($48). They say practice makes perfect, so a quick run-through of the show before the big day is a must. Make sure everyone knows their lines and places, but don’t spend a fortune on a restaurant dinner. Instead, ask a friend with a sweet place to host your rehearsal dinner as their wedding gift, and ask attendees to bring a dish that is special to them, as well as an index card with the recipe for their dish. 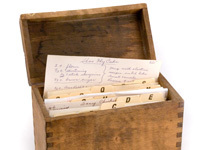 It’s low-stress, low-cost, and will fill your first recipe box as a couple with the makings of cherished foods from your favorite people. 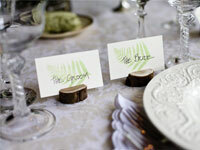 Sending unique, functional and eco-friendly invitations can be surprisingly simple. Look for recycled, handmade or plant-based paper and vegetable- or soy-based ink. Postcards or single sheet (folded and sent) invitations are easy ways to eliminate envelope waste. For a self-described “ecology geek” like Mike Weilbacher, the chance to direct the Schuylkill Center for Environmental Education—Northwest Philly’s 340-acre green treasure—is a dream realized. 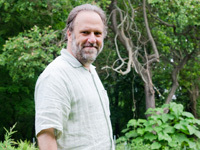 Formerly executive director of Lower Merion Conservancy and, for the last year, Abington’s Briar Bush Nature Center, the Long Island native is one month into his new post, and busy creating new programming that will attract both children and adults to what he refers to as the “Mother Ship” of local nature centers. Anna Bario and Page Neal are in the business of turning sparkly daydreams into reality, with lessened impact on people and planet. From their Bario-Neal studio/shop in Queen Village, they handcraft fine jewelry from conflict-free gems and reclaimed precious metals, both from their own designs and custom orders. With so much excellent grub being produced all around our city, building your wedding menu with seasonal foods has never been easier—or more delicious. Jennifer McCafferty holds sustainability as the core value of JPM Catering, based out of a Manayunk kitchen and serving the city and Main Line. When choosing a wedding venue, consider parks, private gardens, local farms and even friends’ backyards before looking to conventional hotels and ballrooms. Facility rental fees paid to nonprofit organizations can benefit historical or environmental preservation and programming. For a winter wedding, investigate outdoor spaces with indoor counterparts, or seek out venues with environmental building credentials. Banding Together: Cutting-edge architectural salvage company Greensaw has taken the bold step of becoming an employee-owned co-op. Will the risky move pay off? Can one imagine an economy in which labor hires capital? Where workers have a legal right to the profits and legal responsibility for the liabilities because they are the owners, where workers jointly manage the firm and themselves in a democratic fashion? On a blustering snowy weekend in late January, a group of men and women gathered in front of a bedsheet and projector in a timber-framed cabin in Eagles Mere, Pa., to discuss how to become a cooperatively owned business. In between breaks for venison stew, toboggan sledding and heating snow for water, those in attendance heard impassioned speeches about governance and power. Debates over fairness, dignity, and responsibility flared and simmered. A sample policy and procedures manual was presented and picked apart as each person was asked to truly consider Greider’s question.